If I wasn’t doing this, I’d be a: Movie producer or professional bass fisherman (the latter being the preference). Most impressive person I’ve ever met: One of my former bosses, Steve Stallworth. He never met a person he couldn’t charm. I learned a great deal from Steve coming up through my time at the Orleans Arena in Las Vegas. I owe a great deal of my success to him as he gave me my first real executive opportunity in this industry. My favorite IAVM program I ever attended was: VenueConnect 2014. That is the conference where I was awarded my CFE designation. At that same conference, my arena won the Venue Excellence Award. A double whammy! One up-and-coming venue star in the arena industry is: Tyler Baldwin, the booking manager of the Orleans Arena. He is destined to be a general manager or executive director someday. One of my goals for this year is to: Do better budgeting! How do you plan to help elevate the profession? 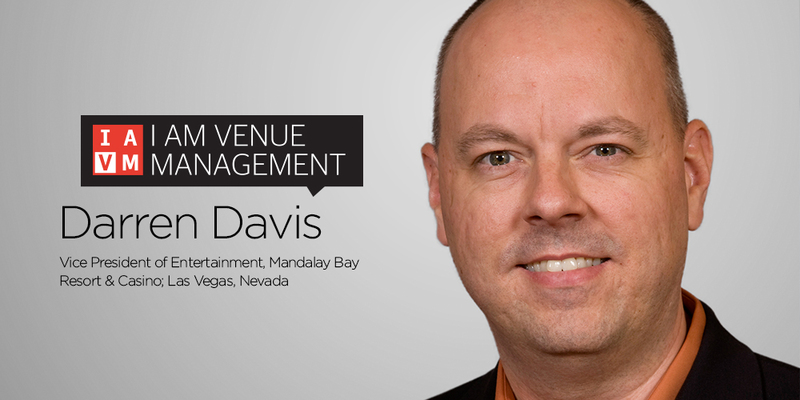 By being more involved in IAVM and the initiatives it supports. Where do you see new growth opportunities in the profession? Events outside the norm. For example, we just recently hosted our second eSports event. With over 10,000 (sold-out) raving fans for our EVO competition, there is no doubt this genre of entertainment is here to stay and only getting better. How do you stay current with industry trends and developments? I read a lot of magazines…. Pollstar, Sports Business Journal, Facilities and Event Management Superbook, local entertainment publications, and, of course, Facility Manager magazine. Who are three people you’d invite to a dinner party and why? My grandfather (I miss him dearly), my best friend from high school (I haven’t seen him in years), and my wife (when you are in this business, you hardly ever see your family!). Darren is the Vice President of Entertainment of the Mandalay Bay Resort & Casino in Las Vegas, Nevada.